Call S & S Cleaners in Gainesville, FL to discuss your wedding gown and cleaning needs. S & S Cleaners in Gainesville, FL offers todays’ bride a full range of services designed to take care of all your bridal gown needs. Often an initial consultation about your upcoming wedding will reveal that you may need restoration of an older gown or press only service of a new gown. Many aged gowns can be restored to wearable condition by special handling techniques that can remove age spots or mildew. Experienced finishing of restored gowns is available. In some instances, you may need to find out how well a gown will restore before you rely solely on that dress for your wedding day. Our years of experience in this delicate area are one of our greatest assets. S & S Cleaners works closely with two of Gainesville’s wedding gown retailers to provide touch up services for their display gowns or to solve needs of their gown clients. This is the most specialized service S & S Cleaners offers. 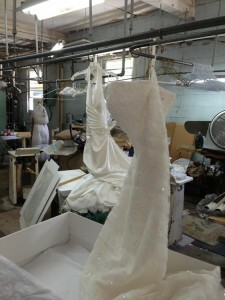 Stephen Smith, the owner of S & S Cleaners, will personally inspect and box your gown. He believes in offering you his personal touch to assure your gown is in expert hands. S & S cleaners is proud of their wedding gown cleaning and invites you to inspect your gowns restored condition prior to sealing it in your heirloom box. This is virtually unheard of in the cleaning industry as most retailers and drycleaners do not do their own cleaning and processing of gowns. A third party wholesaler processes your gown and seals it before you even have a chance to see it. S & S Cleaners encourages inspection and is very proud of our ability to restore and seal your gown. *Wedding gowns must be prepaid. Call S & S Cleaners today to discuss your wedding gown and cleaning needs.